The new range of ERWEKA light dissolution testers delivers the proven ERWEKA quality in a comprehensive economic package for a budget for simple dissolution testing with USP method 1, 2(included), 5 and 6. 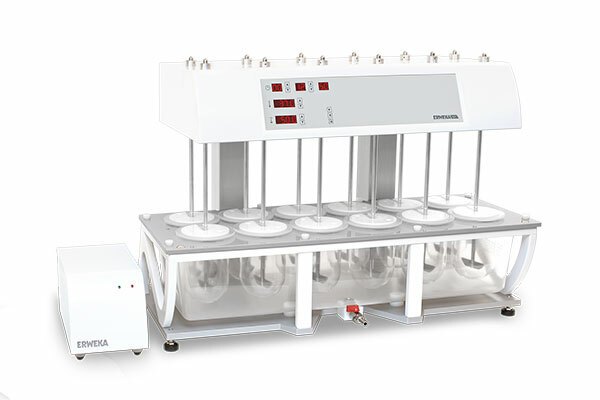 The DT 1212 light is equipped with 12 test stations and a fixed drive head (high-head), allowing easy access to each of the 1000 ml vessels for manual sampling. The delivered package also includes vessel centering rings with shafts, low evaporation covers, USP 2 paddles and shafts as well as a distance ball for right height adjustment of the paddles. All managed in a light and compact design. The unique water bath of moulded PET is equipped with the time-proven ERWEKA water outlet for easy cleaning. The external flow through heater reduces the influence of external vibrations and ensures a constant temperature. All these features make sure that the ERWEKA DT 1212 light dissolution testers are the perfect entry-level devices for the world of dissolution testing. Download the Product Spec Sheet here.